Britton fails to feature in final, while English cruises into tomorrow’s semi-final, writes James Sullivan. 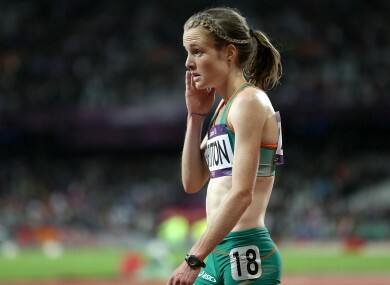 There was disappointment for Ireland’s Fionnuala Britton in the final of the women’s 10000 metres at the European Championships in Zurich this evening. The Kilcoole AC runner finished in eight place, in a time of 32:32.45, in a slow tactical race won by forty year old British runner Jo Pavey. The thirty year old, who finished fourth in the same event at the previous European Championships in Helsinki two years ago found herself dangerously close to the back of the main pack for much of the race. However none of her competitors were willing to make a move from a long way out, and the race was reduced to a long sprint for home in the closing few laps, with Britton gradually forcing her way back into contention. Britton, will now turn her attention to the marathon on Saturday morning, and shined some more light on her curious decision to make her debut over the iconic 26.2 mile distance with such short notice. Earlier this evening there was a more positive outcome for Mark English, who qualified with ease for tomorrow’s semi-finals of the men’s 800 metres. The 21 year old won heat two in a time of 1:47.38, with Great Britain’s Andrew Osagie, finalist at the 2012 London Olympics, failing to qualify, back in fifth place. The 21 year old Donegal native, who now runs for UCD, sat comfortably behind the leaders for much of the race, before making his move with 200 metres remaining, claiming the lead, and holding off Poland’s Artur Kuciapski in second place comfortably, visibly easing off at the end. There was less fortune for his compatriot Declan Murray who failed to qualify from heat three this evening. The American born athlete finished in seventh place in his debut major championship, with a clocking of 1:50.01, well behind race winner Adam Kszczot of Poland (1:47.92). The 23 year old made all the right moves throughout the race, and positioned himself well, but simply had nothing left in the legs come the finishing straight, hindered by a trip late on.